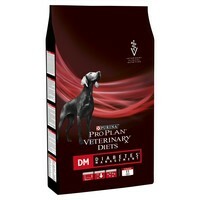 Purina Pro Plan Veterinary Diets DM Diabetes Management Dry Dog Food is a complete and delicious veterinary diet that has been specially formulated to help regulate blood glucose (sugar) levels in diabetic adult dogs. The formula contains low levels of carbohydrate and optimal levels of fibre to reduce the upsurge in blood glucose that happens after meals. Additionally, Purina DM contains a natural bean extract that has been shown to control blood sugar levels after a meal and is rich in antioxidants to help neutralise free radicals produced with diabetes.